Published: Aug. 30, 2014 at 09:36 p.m. 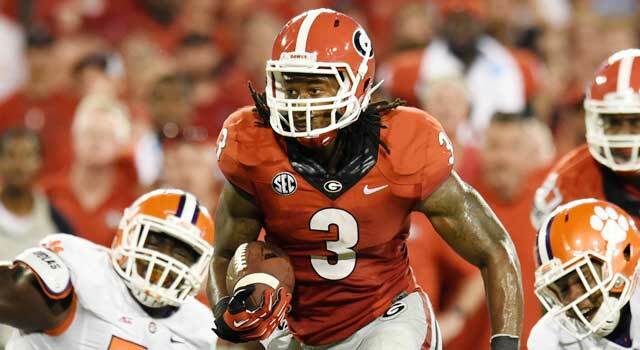 Updated: Aug. 31, 2014 at 10:02 a.m.
Georgia's Todd Gurley had no trouble finding running lanes against Clemson. Georgia running back Todd Gurley rushed through, over and around the Clemson defense on Saturday night during a dominant performance in one of the weekend's biggest matchups in college football. The junior, who will be eligible for the 2015 NFL Draft if he foregoes his remaining NCAA eligibility, ran for 198 yards on just 15 carries (13.2 yards per carry) with touchdown runs of 23, 18 and 51 yards. Gurley (6-foot-2, 233 pounds) also returned a kickoff 100 yards for a fourth touchdown, giving him 293 all-purpose yards for the night (he lost five yards on one reception). Clemson's two-year, home-and-home contract to play the Bulldogs ended up being a showcase for Gurley. He was nearly as impressive at Clemson in last year's opener, rushing for 154 yards on just 12 carries. In two career games against the Tigers, Gurley scored six touchdowns. The Heisman Trophy candidate's next stop? At South Carolina, where the Gamecocks defense is reeling after allowing 680 total yards to Texas A&M in a 52-28 loss on Thursday night. Absent a complete turnaround in a single practice week for the South Carolina defense, Gurley is likely to be dominant again in the key SEC East matchup.